As you can see from the cover, the heroic figure in Skousen’s book is Adam Smith and his “system of natural liberty.” (Interestingly, the official pub date of the first edition of Skousen’s history was March 9, 2001.) All of the “worldly philosophers” – Ricardo, Say, Mill, Marshall, Menger, Marx, Fisher, Keynes, Schumpeter, Friedman, Krugman — are judged as defenders or critics of the great Scottish philosopher, and whether they advanced or attacked the House that Adam Smith Built. 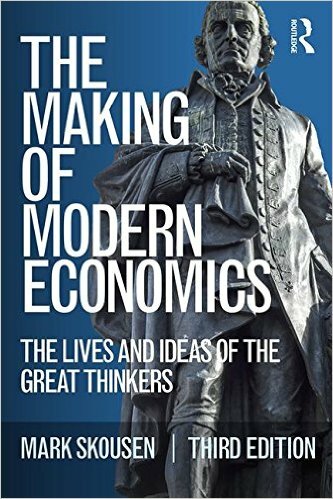 Routledge, the top British academic publisher (famous for publishing the works of Hayek, another hero in Skousen’s work), is now the publisher of this bold history of the great economic thinkers. What’s the new edition all about? Second, the third edition updates the chapter on Karl Marx, particularly the resurrection of the Marxist-inspired “liberation theology” in Latin America, with comments about Pope Francis and his severe criticism of capitalism. The growth of socialism and corruption in Latin America is discussed. Third, the final chapter, “Dr. Smith Goes to Washington: Market Economies Face New Challenges,” has been completely revised. Here Skousen focuses on the West’s decline in economic freedom in consequence of higher deficits, taxes and regulations, and the growing debate over inequality, austerity, and the need for a new brand of capitalism following the financial crisis of 2008. The chapter ends on a positive note, with discussions on the advances in game theory, auction design, experimental economics, behavioral finance, and other aspects of the new “imperial” science. The new edition is also available directly from the author at a discount. Amazon charges $47.95 for the paperback, but you can buy directly from the author by calling toll-free 1-866-254-2057. You pay only $30 plus $5 P&H. (Orders from outside the US, please add $15 extra for airmail–$45 total.) Or order online at www.miracleofamerica.com. 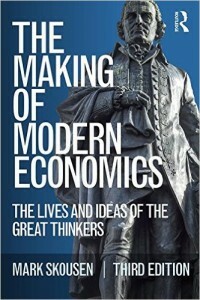 In 2009, “The Making of Modern Economics” (the 2nd edition) won the Choice Book Award for Excellence in Academia. It was recently ranked #2 in the Ayn Rand Institute’s Top Ten List of “Must Read Books in Economics.” It has been translated into five languages — Spanish, Chinese, Turkish, Mongolian and Polish. What’s Different about “The Making of Modern Economics”? Skousen’s history is a bold, new account of the lives and ideas of the great economists–Adam Smith, Karl Marx, John Maynard Keynes, Ludwig von Mises, Milton Friedman, and many others–all written by a top free-market economist. Presented in an entertaining and persuasive style, Professor Mark Skousen tells a powerful story of economics, with dozens of anecdotes, illustrations and photographs of the great economic thinkers. First and foremost, Skousen tells the remarkable untold story of free-market capitalism’s long-running battle against Keynesianism, Marxism, socialism and other isms. It is an account of high drama with a singular heroic figure, Adam Smith and his celebrated “system of natural liberty.” The running plot involves many unexpected twists and turns; sometimes our hero is left for dead, only to be resuscitated by his free-market friends; the story even has a surprise ending. All previous histories tend to give a dry, disjointed, and helter-skelter account of economists and their contradictory theories. But Skousen unifies the story of economics by ranking all major economic thinkers either for or against the invisible hand doctrine of Adam Smith. Thus, Marx, Veblen and Keynes are viewed as critics of Smith’s doctrine, while Marshall, Hayek and Friedman are seen as supporters. Using this ranking system, The Making of Modern Economics offers a full-scale review and critique of every major school and their theories, including classical, Keynesian, monetary, Austrian, institutionalist and Marxist. Think of The Making of Modern Economics as a contra-Heilbroner history. It’s a perfect antidote to all those biased, inaccurate attacks on the free market and its proponents. Skousen records the lives and ideas of important economists often ignored in other histories, such as Montesquieu, Ben Franklin, J. B. Say, Frederic Bastiat, Friedrich List, Herbert Spencer, Ludwig von Mises, Knut Wicksell, Philip Wicksteed, Max Weber, Irving Fisher, Roger Babson, Frederick Taylor, A. C. Pigou, Joan Robinson, Murray Rothbard, and the three Paul’s: Paul Sweezy, Paul Samuelson and Paul Krugman. Skousen’s book also restores the vital role of the Austrian and Swedish schools in the marginalist revolution and the development of monetary economics. It emphasizes the impact of other disciplines on economics, such as evolution, sociology, and religion. Skousen’s book brings history alive with exciting new insights into the lives of the great economists through in-depth biographies and the author’s own research, revealing an amazing tale of idle dreamers, academic scribblers, occasional quacks and madmen in authority. –Why Adam Smith burned his clothes…and then burned his papers. –The “satanic verses” of the poet Karl Marx. –Were Malthus, Ricardo, Marshall and Keynes anti-female? –The infamous grading technique of Chicago’s Jacob Viner (he regularly flunked a third of his class). –The sexual scandals of Karl Marx, Carl Menger, Joseph Schumpeter and Friedrich Hayek. –Keynes the palm reader, and Friedman the amateur hand-writing analyst. –Which famous economist is buried next to rock star Jim Morrison in Paris? –How Darwin and Wallace discover their theory of evolution after reading Malthus. –Why Malthus and the doomsdayers have been proven wrong about overpopulation and environmental crises. –The strange case of David Ricardo: Why Schumpeter, Keynes, and Samuelson admired him–and deplored him. –Why Malthus refused to have his portrait made until age 67. –Why Hayek blames John Stuart Mill, a hero of classical liberalism, for popularizing socialism among intellectuals in the 19th century. –The real origin of the epithet “dismal science,” and why critics are now calling economics the “imperial” science, with ever-increasing applications in law, finance, history, and politics. –How John Stuart Mill and the disciples of David Ricardo became hostage to the Marxists, and how Carl Menger and the Austrians revived the laissez faire model of Adam Smith from oblivion. –The inside story of three multi-millionaire economists–David Ricardo, Irving Fisher and John Maynard Keynes. –The bizarre story of Jeremy Bentham: from democratic reformist to utilitarian fascist. –The socialist origins of the American Economic Association and the London School of Economics. –Veblen’s incredible prophecies about World War I and II. –Thorstein Veblen versus Max Weber: Who had a better vision of capitalism? –How Irving Fisher became an advisor to the fascist Mussolini. –The little-known story of how the economics establishment in the West (including economists at Cambridge, Harvard and Yale) failed to forecast the 1929-32 economic collapse. –How Austrian economists Ludwig von Mises and Friedrich Hayek were able to predict the 1929-33 crisis, yet failed to convince the world of their theories. –How Keynes saved the world from Marxism in the 1930s. –The truth about Keynes’s homosexuality and the rumor that his Cambridge colleague, A. C. Pigou, was a Soviet spy. –Gross Domestic Product (GDP)–how a Keynesian statistic was invented by a Russian. –How Irving Fisher’s misinterpretation of his quantity theory of money led to his losing a fortune on Wall Street, and how Milton Friedman avoided repeating Fisher’s blunder. –Why Friedman and the Chicago school triumphed over Mises and the Austrian school in discrediting Keynesianism and restoring the Adam Smith model of market capitalism. Finally, The Making of Modern Economics is the first fully-illustrated history of economics, with over 100 charts, portraits, and photographs, including a picture of…. …over 75 rare and unusual photos and portraits of famous economists. The French Revolution: Laissez Faire Avance! Mark Skousen (Ph. D., economics, George Washington University) is a Presidential Fellow at Chapman University in California. He has taught economics, finance and business at Columbia Business School, Barnard, Mercy and Rollins colleges, and Chapman University. Since 1980, Skousen has been editor in chief of Forecasts & Strategies, a popular award-winning investment newsletter (www.markskousen.com). He was analyst for the CIA, a columnist to Forbes magazine, chairman of Investment U, and past president of the Foundation for Economic Education (FEE) in New York. He is the editor of his own website, www.mskousen.com, and is the producer of FreedomFest, “the world’s largest gathering of free minds,” which meets every July in Las Vegas (www.freedomfest.com). His economics works include The Structure of Production (NYU Press), The Big Three in Economics (ME Sharpe), The Making of Modern Economics (Routledge) and Economic Logic (Capital Press). His investment books include Investing in One Lesson (Capital Press), and The Maxims of Wall Street (Eagle Publishing). In honor of his work in economics, finance and management, Grantham University renamed its business school, “The Mark Skousen School of Business.” Based on his work The Structure of Production (NYU Press, 1990), the federal government now publishes Gross Output (GO) every quarter along with GDP.